Part of last week was anything but pleasant. On Friday Lavanson fed both cats, Luis & Luego, as he normally does. On Saturday morning he remarked to me that Luis was a "no show" for breakfast. We both found this a bit odd because Luis is always quite prompt for meals and meows loudly starting about 1/2 hour before mealtime. In the mornings when we open the curtains and look up he is usually on the roof looking down. Luis did not show up for dinner on Sat either. We had company that day and it was also the day of the expat family meet up so I put it aside and figured he would show up later. I was so busy that I didn't have time to really worry too much about him but by the time our guests left it was around 8pm and he was still no where to be found. On Sunday morning only Luego was there for breakfast and I was really worried by that time. He had never been gone for this long. Now I am in a semi panic! Although I know that male cats will wander off and may be gone for days at a time, generally that is not the case for neutered males. Our yard also has a hole near the drainage pipes where the cats come and go and also some of the dogs that wander around free. Lavanson noticed that on the morning that Luis was missing there was dog manure on our patio. There is a crazy stray dog that hangs out right next door to us. He comes out and growls each time we take the girls for a walk and even when we go by on our way to the bus stop. Overnight it rained pretty hard. I went outside meowing a million times (he will usually come when I call him) -- I went up and down the street and all around our yard. Still no Luis. He NEVER stays out in the rain. What made it really sad was that you could tell that Luego missed his buddy. He is a feral cat but each night he would show up and sleep in the chair under the light on our front patio area. He looked pretty lonely! By Monday I feared that something terrible had happened to him but still hoping that maybe he had just been a "curious" cat and would return soon, prancing in like nothing had happened. Later that day I was sitting on the love seat where I could see the backyard and I noticed a small, still body over near the fence. All I could see was a little head with ears. It looked like Luis. I ran outside and he was just lying there. I picked him up because he could barely walk. He was muddy and his body was limp as I carried him to the house. He wouldn't eat or drink. He also had a strange look in his eyes (which kept closing). I was advised by one of my friends that I should take him immediately to the vet to have him checked. Since we have no car, we called for a taxi and took him into town. He was running a slight temperature and there were signs of inflammation in one leg so the vet ran some blood tests on him. The results showed a higher than normal white blood cell count so he was given 2 different antibiotics and a pain killer. Since it is difficult to give meds to a cat the doctor said that we could bring him back for 2 more treatments and they would administer the antibiotics via injection. We settled the bill for 91,000 colones or about 159 US$. But listen to this part, the bill also included a med size bag of holistic dog food, 2 (1 month applications) of NexGard - kills fleas & ticks, a 3month supply of Advantage (flea & tick killer for the cats) and some dog treats that I bought! The bill for the treatment/visit/exam/test/all 3 visits for antibiotics was probably only around $77. Can you imagine the cost in the states? 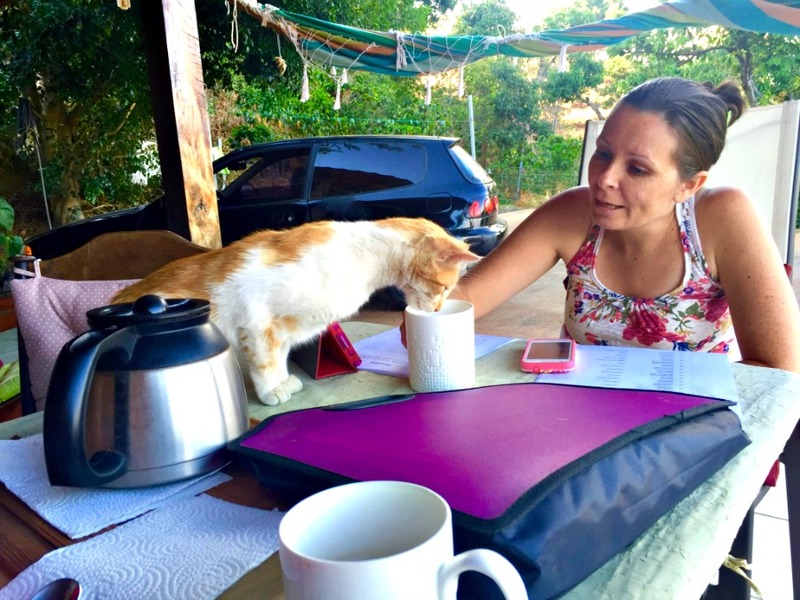 Great medical costs for pets here in Costa Rica!! Make a note! So, we took Luis home to mend. I brought him inside and he mostly stayed locked in one of our spare bedrooms under the bed for 2 days and slept. As he began to feel better, we noticed that he also had a wound on his tail which none of us had noticed on the initial doctor visit. On our 2nd visit for antibiotics we had it checked and turns out there were LOTS of larvae inside the wound. Sickening Ugh! The doctor said they would need to keep him and put him under to remove them. We could come back to pick him up later in the afternoon. Once we got him home and the anesthesia wore off, he began to act like himself again. He was eating and running around the yard. I tried to get him to stay inside again that night but he is not litter box trained and he was antsy to get back outside to his "life". On our 3rd visit, after his injections (and what I thought was our last visit) the doctor said to bring him back again on Monday for a check up. I think they are going to make sure the infection is gone and that his tail is mending properly. So that's pretty much where we are now. Luis is an outside cat and Luego is feral. They both just showed up and sort of adopted us. Luis is a very friendly, charming and intelligent cat. Who could resist? Luego was brought over by Luis when he was a small kitten and they have become good friends. At first we didn't like Luego too much (hence the name, short for hasta luego = bye) but he is really growing on us. He is a nice cat but since he is feral he will not let you get too close. I'd like to point out also that, unfortunately, cats have a rather short lifespan in Costa Rica. 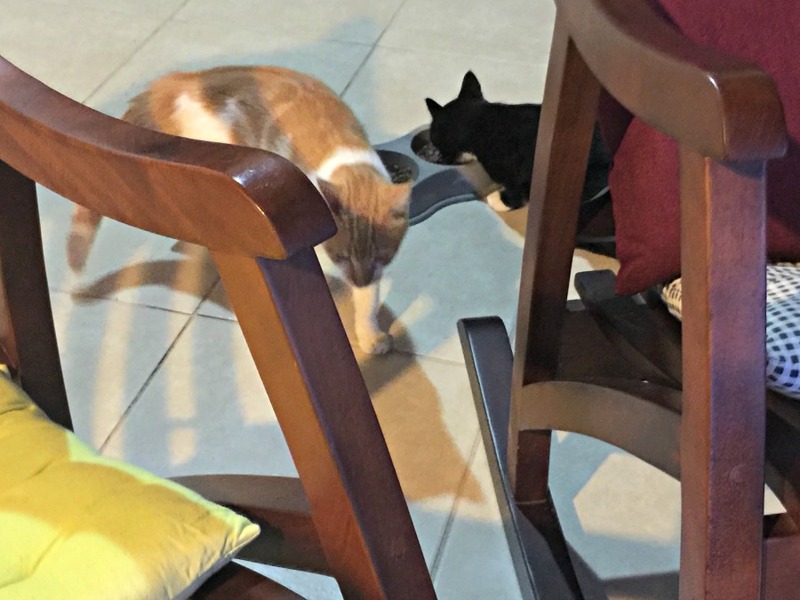 Two other friends in Grecia reported their cats "missing" on the same day and neither have returned as of now. We all live too far away from each other for the incidents to be related but just to show you how common it is. 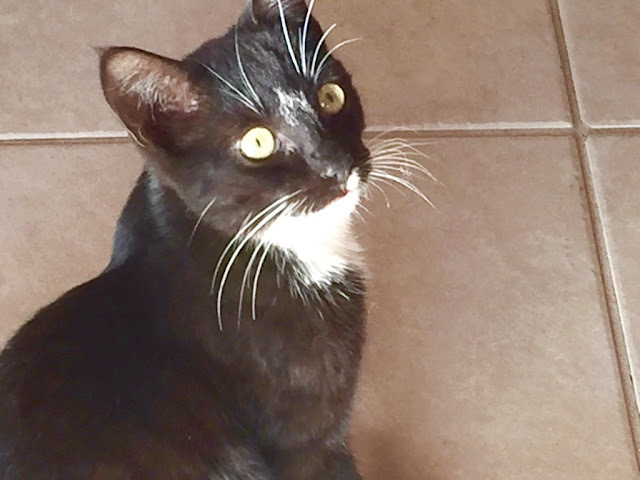 Luis has had all of his vaccinations but Luego has not (I do intend to "capture" him and have him neutered very soon though) There are lots of dangers lurking out there from cars to snakes, and poisonous insects, to dogs and other cats. We heard on one ridge that someone in the area was putting out poison meat and in another town close by, pumas have been reportedly eating pets and livestock! The best way to keep a cat alive is to bring him inside. Even though I never planned to have a cat, I would bring Luis inside if I could, but Lily and Lola, who after a year STILL have not adjusted and simply do not like to be around the cats. Any chance they get, they will chase down the cat with the intention of hurting him (he weighs 7 lbs now - the girls weigh a little under 6 lbs). I have heard that if they ever went to battle the dogs would probably lose, but who wants to take that chance? So, Luis is back outside. I am grateful each day that I hear his meow and see them both ready for breakfast. And that is Life in Costa Rica! Not always a "perfect" paradise! The Day Our Cat Went Missing from Devon on Vimeo. ** note to my email subscribers: please excuse any typos you see in my blog posts as you get the 1st publication which will not reflect corrections -- as I mentioned previously, feel free to click the link and read the corrected version online. Thank you!